Boiled Egg Gravy / Muttai Thokku / Muttai Masala, a very simple and delicious boiled egg masala recipe with step by step photos. Boiled egg gravy is an easy recipe which I try at least once a week and serve with rice or roti. Egg Masala south indian style recipe made using simple ingredients like sambar powder and coriander powder. Boil the eggs and cook with onion, tomato, ginger garlic paste, sambar powder, coriander powder and curry leaves. This is a thick gravy masala which goes very with roti or chapati. We also like to serve it with rasam rice. Sambar powder can be replaced by red chili powder. 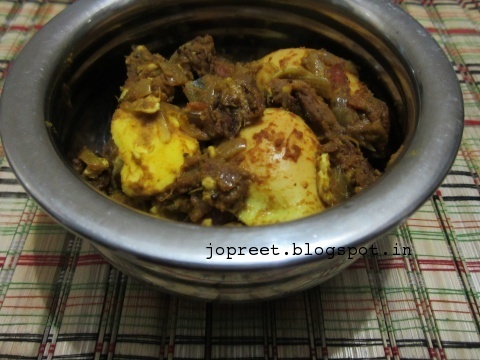 This is not a spicy egg masala recipe as we have used sambar powder. To make it spicy, add few tsp of pepper powder. I have used a clay pot to prepare this simple boiled egg gravy. This is such an easy 10 minutes recipe which can also be tried by bachelors or spinsters. For additional flavors, try adding few mint leaves or coriander leaves or dry methi leaves. Some of the egg masala recipes shared in my blog, Mezhagu Muttai Thokku, Spicy Egg Masala, Mustard Egg Curry, Egg Fried Masala and Baby Potato & Egg Gravy. If you try any of my recipes, then do share your feedback with us. If you are looking for egg recipes, then do check post on indian style egg recipes. Remove the shells of egg. Wash it and make vertically slit marks with a knife. Keep it aside. Heat 1 tbsp oil in a clay pot or kadai or pan. Temper mustard seeds and curry leaves. Add chopped onions and sate a while. Now, add chopped tomatoes and mash the pulp. Add ginger garlic paste and stir well. Now, add turmeric powder, sambar powder and coriander powder. Stir well and add 1/2 cup water. Add eggs and salt to taste. Mix well everything and cook it covered for 10 minutes. If you want it more watery, then adjust the quantity of water and cook accordingly. Serve hot with rice or roti.